Hand crafted and personally selected from the artists that we have worked with for many years, this set of Matryoshka nesting dolls is a unique example of a museum quality artwork. 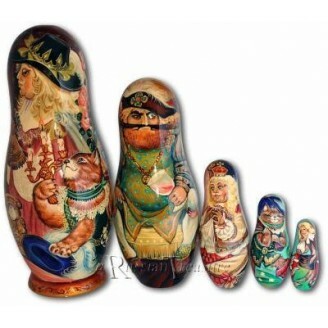 Featuring the world-famous fairy tale "Puss in Boots" these Matryoshka nesting dolls retain the singularity of their shape and author's design. The scenes of the story, painted in vibrant watercolors, smoothly flow into one another, as one carefully examines each Matryoshka nesting doll. The dominant colors to portray the poor miller's son are golden yellow and cobalt blue with snow white of his shirt, while the princess is wearing a coral dress with the drops of pearls adorning her garment. The artful Puss-in-Boots, represented in this set of Matryoshka nesting dolls, is painted to wear a rich emerald-green costume with unique gold leaf adornments, same as in the King's outfits. It is the cat who had managed to turn a poor miller's son into the "Marquis de Carabas", by killing the ogre and winning the heart of the princess and the King's blessing. A true masterpiece, this set of Matryoshka nesting dolls fascinates the viewer with its fairy manner of painting and the lightsome representation of the motive. Compliment your loved ones with these beautiful Matryoshka nesting dolls making an unforgettable Birthday or St. Valentine's gift, and letting the spirit of magic back into your world.